THE NUMBER OF craft breweries in Ireland has grown by more than 500% in the last five years. There are now 72 production microbreweries in operation, up from just 15 in 2012, according to a recent Bord Bia report. Cork is leading the way with 10 microbreweries, followed by Dublin with seven and Wicklow and Donegal with five each. Westmeath is the only county in the Republic of Ireland with no microbrewery, while 10 counties have one each. 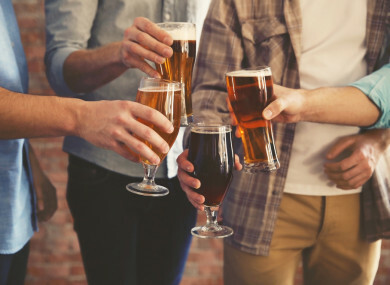 The report estimates that there are some 100 microbreweries in total, with around 30 being brand owners that source their product from production microbreweries. The Bord Bia report found that Irish Craft Beer is performing well. In 2012, the recorded consumption market share was 0.6% but that figure reached 3% this year. Output from the breweries is growing significantly, from 37,000 HL (100 litres) in 2012 to more than 176,000 HL (100 litres) in 2016. That’s a growth of almost 475%. The volume of production destined for export is estimated at 22% or 39,000 HL (100 litres). Denise Murphy, Beverage Sector Manager at Bord Bia said, “While it is acknowledged that the Irish craft beer category is still very young and that these levels of growth are from a low base, the growth has been sustained over a number of years and looks set to maintain its upward trajectory. As the category expands, the importance of export business increases for the sector. Demand for craft beer is rising in most markets around the world, driven by consumer preferences for premium product and artisan production. The total turnover of craft beer producers in 2016 is estimated at €52 million, up 30% from €40 million in 2015. In the five years since 2011, turnover has increased more than ten-fold. Email “County breakdown: Cork leading the way as Irish craft breweries grow by 500% ”. Feedback on “County breakdown: Cork leading the way as Irish craft breweries grow by 500% ”.